3. there are three button on the top of the money jar. 4.you can subtractionit the digital on the lcd screen. 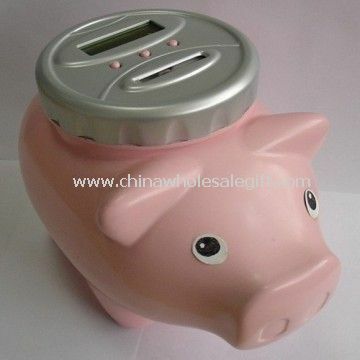 11. one money jar for counting one kind of currency. Euro only, USD only,ect. 1.operates on 2AA batteries (not included). If you want to make custom coin counter delicate design automatically distinguish coins with your logo,slogan,telephone,website,email , please send us your design or give us instructions about your imprint.We'll send a free virtual art proof for your approval,you can ask a real sample with logo before production too. Our coin counter delicate design automatically distinguish coins is popular as promotional,advertising, business,corporate gifts. Didn't have a good gifts idea yet? We also have a team can give you suggestion, all of them have more than 8 year experience in gifts market, familar with promotions,events,trade show,conferences etc. If you have any question , just click the Enquiry below to send us messages. $40.00(G) per color, per side. $25.00(G) on re-orders. Add .20(G) per extra color, per side, per piece. (2 Color Maximum) Second Side Imprint: Add .20(G) per color, per piece. You can send CWSGift your logo or give us instructions about your imprint by simply replying to the enquriy or quotation email. You should receive a free virtual art proof for your approval before production. We accept high-quality laser prints, or digital art on CDs or by e-mail. For faster serviceand better imprint quality, we recommend providing artwork via e-mail. Artwork shouldnot need any additional touch-up, design, color separation or rearranging for use. The use of licensed artwork requires a written release. Artwork when submitted isassumed to be in full compliance with laws governing copyrights, trademarks, etc.We are not responsible for typographical errors incorporated into submitted artwork.Factory reserves the right to make slight alterations in copy and logos to adapt to imprinting processes. Please Note: CWSGift reserves the right not to print any logo or message that isdeemed inappropriate. QR Codes: QR codes are most readable when printed on flat surfaces using a highcontrastimprint [such as a white imprint on dark surfaces or a black imprint on lightsurfaces]. QR codes may not be readable when printed on coarse-weave materials orcurved surfaces. For the best results, the QR code should be black with a white border.A pre-production proof is recommended to test the functionality of the code.CWSGift is not responsible for the quality, accuracy or usefulness of QR codeoperations or content. CWSGift does not police or endorse any QR code content. We recommend using vector art because it produces the highest quality artwork.It is "resolution independent," which means it can be enlarged without affecting the quality of your imprint. If electronic art is not available, please provide sharp, high-contrast, color-separated or black-and-white artwork. Artwork will be returned upon request or it will be discarded. Artwork should be submitted within 24 hours of sending the order.Please include purchase order number in the subject line of the e-mail. Multiple files should be compressed in .zip or .rar format. File size limitation via e-mail is 10MB. CWSGift will honor its return policy for any product that it determines does not meet its standards for quality and workmanship. CWSGift are committed to working with our vendors and employees to incorporate environmentally friendly business practices into our daily operations. These measures benefit our local communities, states and society at large. We will continue to identify and act on opportunities to minimize our impact on the environment. Packaging:Bulk packed or according to your requirement,Special packaging may incur additional production time. Chinawholesalegift.com is Today Leading gifts supply chain management provider in China,managing the supply chain for small-volume, high-volume and chain store,time-sensitive customers goods. Because we have more than 15 years experience in this area, we konw the keypoint of presents . We had serviced thousands of customers , learned that customer understanding is importand and customer satisfaction always should be our first goal,we are ready to become your professional design, planning, execution, control, and monitoring partner in China.